Happy Wednesday! Even though it's the dead center of the work week, Wednesday is at least the height of it.. it's all a downhill slide into the weekend from here folks! Today's post is short n' sweet. For years I've struggled with lining pictures up exactly where I want them on walls (Doesn't that sound like a cheesy infomercial? Ha!). I've never been able to line up picture frames with each other perfectly, so I usually opt for the random arrangement. Until now! I stumbled across this little gem of a tip today, and had to share it. Hammer nail through a wooden ruler. Hang picture on that nail. Line it on the wall where you want it. Remove picture, push in nail to make an indent. 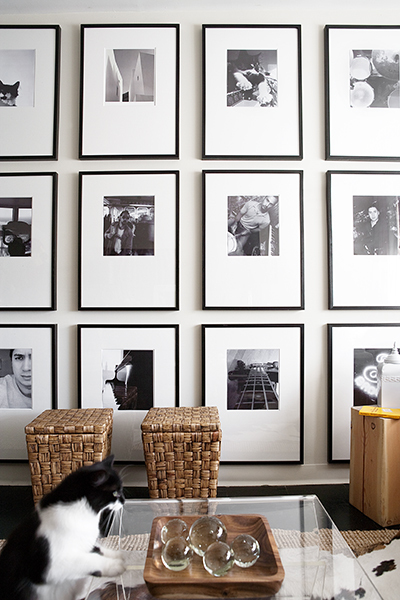 Hang your perfect picture up. There you have it. Easy. This is definitely a "Why didn't I think of that before?" moment, as I think back to how many times I've messed with math, rulers, and pencil marks all over my walls only to get everything completely off! Isn't the internet wonderful? Have a great day! Special thanks to the great blogger who posted this solution. In a pinch I used a piece of string tied between bookcases before. I had a friend hold a flashlight up behind me a few feet, and then mounted my dots w a ruler according to the strings shadow line.. it works perfectly assuming you have tie points and a buddy! I like to use straight pins to hang up pictures! When you remove pictures or rearrange, you dont have any holes to cover up. In fact, good luck finding the hole you used once you take the straight pin out! Have something heavy to hang? Use three or four straight pins together--they hold up really good and amazingly, the holes they leave behind are far smaller than using a small nail. Good luck! hmm..great idea..! while we are decorating a home, this type of things matters a lot that how we decorate our walls and all that. as we know wall decoration includes..wall paint, hanging up pictures,painting etc..
OR... You could just get frames that include hanging templates. Maybe even ones that are printed to look like the frames – and that show you exactly where to place the large, easy to handle (self-leveling) nailing 'button'. 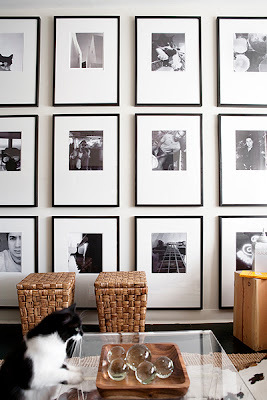 No more extra nail holes behind your pictures!